FEG welcomed more than 100 guests to the George W. Bush Presidential Center in Dallas, Texas on May 8 for a day of education, learning, and networking. This was our second such event in Dallas (tenth, if you consider the history of Larry Thompson and Associates, which FEG acquired in 2016) and we were pleased to have an outstanding group of speakers share with us their perspectives on a wide range of macroeconomic and investment topics. At the end of the day, guests had the chance to tour the Presidential library and museum. The museum included a temporary exhibit on the first ladies of the United States, a full-scale replica of the Oval Office during President Bush’s time in Washington, and a more permanent exhibit displaying videos and memorabilia from his presidency. The “A Nation Under Attack” exhibit, which included details from 9/11 was particularly moving. The morning started off with a free-flowing discussion from Ken Hersh, current president and CEO of the George W. Bush Presidential Center (Center) and co-founder and current Advisory Partner of NGP Energy Capital Management, a Dallas-based private equity franchise in the natural resources industry. Mr. Hersh shared with attendees that the Center was designed to be non-partisan–a library and museum operated by the National Archives, as well as an institute whose purpose is to engage communities in the United States and around the world by developing leaders, advancing policy, and taking action to solve today’s most pressing challenges. The guiding principles of the institute focus on domestic excellence, global leadership, and engagement. The second part of Mr. Hersh’s presentation was more free-flowing. He started with a quote from Canadian Prime Minister Justin Trudeau: “The pace of change has never been this fast, yet it will never be this slow again.” Mr. Hersh contrasted the fast world (technology) and the slow world (government) and the inevitable conflict between the two. He used the example of “disruption,” which has a positive connotation in the fast world, but a negative one in the slow world. Cyberspace is where the slow and fast worlds are colliding, as many can and do use the freedom of the network against itself and/or to the advantage of those meddling. The winner of this conflict between fast and slow will depend largely on perspective and location, according to Mr. Hersh. For example, in the U.S., we are cautious of companies like Facebook, Amazon, and Google – we question who owns the data and wonder if these companies have too much power. Comparatively, Tencent, Alibaba, and Baidu are celebrated in China and given as much capital as they need, as the Chinese social construct maintains that the government owns the data and has the power. Mr. Hersh ended his session with his prediction that the slow world would win, observing that in Washington “everything is impossible until it is inevitable.” The authority and power of those in certain positions of our government is staggering, according to Mr. Hersh; therefore, our government will likely have the ultimate say on how we are positioned, how our industries are ordered, and how we interact as a people. In China, the question of whether or not the government will win seems far less debatable. After a short refreshment break, Tony Crescenzi shared PIMCO’s global macroeconomic and investment outlook. Mr. Crescenzi was broadly optimistic but suggested that investors should not bet against the “New Normal” or “New Neutral” just yet. Broadly, instead of 3% GDP expectations (2% productivity + 1% labor), Mr. Crescenzi suggested that investors should expect more in the neighborhood of 1.3% (0.8% productivity + 0.5% labor). He also observed that recession indicators point against an imminent recession and probabilities remain low over the cyclical horizon: <10% in the U.S. and <20% in the euro zone. Per PIMCO, the Tax Cuts and Jobs Act and the recently-approved federal spending bill will boost real GDP by 0.6% in 2018 and 0.4% in 2019; however, the benefits thereafter will fade quickly. Moreover, the deficits created by these policy changes will grow, making U.S. infrastructure spending much less likely. Mr. Crescenzi also shared that China’s growth, industrialization, and general reduction of poverty has earned the country the benefit of the doubt and that skepticism regarding China’s debt load and growth rates (among other geopolitical concerns) might be overblown. A relaxed networking lunch was followed by an eye-opening discussion from Ben Hunt. According to Dr. Hunt, artificial intelligence (AI) allows us to process and visualize unstructured data. AI applications for business and financial services are somewhat limited at present, as this technology does not work as well with the structured data prevalent in those fields; however, Dr. Hunt suggested there are still important insights to be gained from this revolutionary field. He used quantitative easing (QE) as an example. With each successive implementation, QE has been less effective, yet somehow this emergency market action has become a permanent policy tool. One part of QE that has become more successful than central bankers could have possibly imagined is the communication policy, or “forward guidance.” Game Theory calls this common knowledge and warns that the “authorities” are not telling us the facts, they are telling us how we should think about the facts. Humans are apparently hard-wired for this to work. Dr. Hunt provided a visual example of a wagging finger, explaining that pointing and wagging a finger at an audience is visually authoritative, leading an audience to imply more credence and significance to a particular statement or comment than may be warranted. AI can be used to visualize these narratives, because in many cases perception becomes reality. Dr. Hunt referred to natural language processing (NLP), which is the process by which an AI program “reads” thousands of documents and logs the frequency and similarity of phrases and words, creating an output of all of the influencers on a particular narrative. The distance between words/phrases in the output implies how closely related they are and the color of the words suggests whether the sentiment was positive or negative. The takeaway was that tools like these can be used as another facet in the decision-making process to gain a better understanding of the narratives around any particular theme and how they have changed over time. Dr. Hunt shared an example of the Mexico narrative. 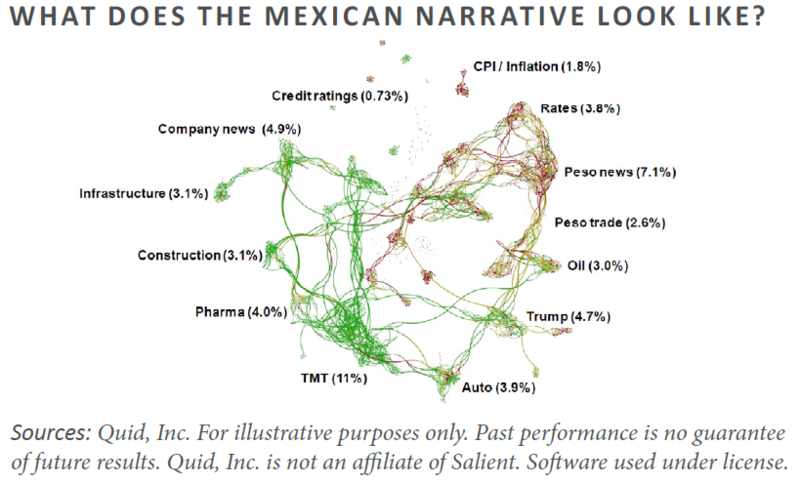 Among the more significant words/phrases were “TMT,” “Peso news,” “oil,” “rates,” and “Trump,” each with a differing level of positive or negative sentiment. Dr. Hunt closed his session with some words of advice. He believes that AI will not replace humans; it will save them. As long as we continue to exercise our ability to think critically, we should be able to take advantage of the opportunities of technology without allowing ourselves to become overcome and overwhelmed. After a short afternoon refreshment and networking break, the day concluded with a wide-ranging discussion on emerging and frontier markets, led by CJ Morrell, a portfolio manager for their emerging and frontier markets equity funds. Sloane Robinson likes to distinguish between those countries that demonstrate consistent productivity growth and those where long term productivity growth has been essentially flat. They view the former as secular growth opportunities, the latter as more cyclical in nature. China and India are both obvious secular growth stories, both have demonstrated tremendous long-term productivity growth and are expected to continue to do so well into the future. The sheer size (and growth rate) of the Chinese and Indian middle class and their projected spending are expected to provide massive long-term investment opportunities. China is a country where service sector growth has been consistently close to 10% for most of the past decade and it is here where Sloane Robinson finds the bulk of their secular compounder ideas. Whereas the Industrial and Construction sectors tend to move much more closely with the domestic credit cycle and are of less interest. Credit growth is a meaningful concern for U.S. investors in China, but Mr. Morrell pointed out that the Chinese authorities share investors’ concerns and have done an excellent job of reining in credit growth from overextended levels over the past two years. India has consistently had the highest real GDP growth in the world. It’s growth is getting a further cyclical boost due in no small part to the reform policies of Prime Minister Narendra Modi, which include improved bankruptcy and property laws as well as a big push on boosting Foreign Direct Investment. Morgan Stanley estimates Indian real GDP growth to improve from 6.3% in the third quarter of 2017 to 7.5% in 2018. Mr. Morrell indicated that while India is a great place to find companies that are compounders, investors must be aware of the high valuations where growth is already priced into the security. Mr. Morrell then pointed out that in the Frontier markets Vietnam is another great secular growth opportunity. 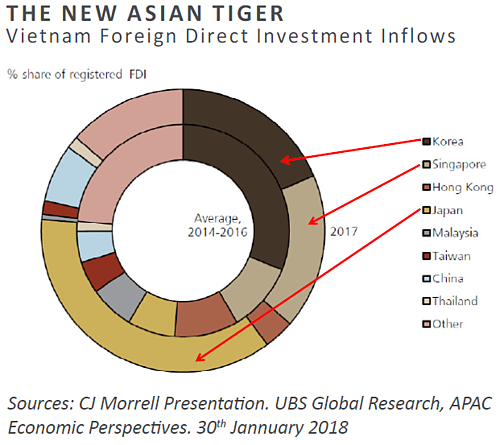 The country now appears to be the new low-cost manufacturer and is benefitting tremendously from increased foreign direct investment, predicting that this new “Asian tiger” could be a source of opportunity for investors. Regarding cyclical opportunities, Mr. Morrell suggested that Argentina is becoming more interesting, post the recent dramatic sell off in the currency. Despite having relatively high GDP per capita vs other countries in Latin America, household debt to GDP (private credit) is woefully low at only 15% vs Brazil at closer to 50%. A stabilized macro environment would allow for a meaningful pick up in credit growth. Sloane Robinson finds countries like Argentina and Egypt to be more interesting cyclical opportunities than either Brazil or South Africa. While each had very distinct topics, our speakers had some common themes in their messages. Global change was among the stronger threads in the discussions. Our ability to survive and thrive as investors (and humans) depends largely upon our ability to think critically and analyze complex situations. While none felt the end of this sea change in global economics and technology was anywhere near, it has created a multitude of opportunities for investors willing to be open-minded. There are certainly risks (investing and otherwise) to consider, but the prospects are also great for those willing to think differently. We would like to express our sincere gratitude to those clients and friends of the firm who attended the symposium, our speakers, and the George W. Bush Presidential Center for making the day possible. If you would like to join us at our next event, please save the date for our Investment Forum on September 23 – 25, 2019 in Cincinnati, Ohio. This report was prepared by Fund Evaluation Group, LLC (FEG), a federally registered investment adviser under the Investment Advisers Act of 1940, as amended, providing non-discretionary and discretionary investment advice to its clients on an individual basis. Registration as an investment adviser does not imply a certain level of skill or training. The oral and written communications of an adviser provide you with information about which you determine to hire or retain an adviser. Fund Evaluation Group, LLC, Form ADV Part 2A & 2B can be obtained by written request directly to: Fund Evaluation Group, LLC, 201 East Fifth Street, Suite 1600, Cincinnati, OH 45202, Attention: Compliance Department.